How to get there: The standard access from Oslo is to drive E-18 to Drammen, then continue along E-134 through the cities of Kongsberg and Notodden. Approximately 20 kilometer after Notodden is the small community Sauland, make a right there up Tuddalsdalen towards Rjukan (the last part of this road is closed in winter). Continue across the highest point on this road and until west of lake 1138. The road has a short unpaved section with parking on the right hand side and the Gaustatoppen trailhead on the left side. The trailhead is located at GPS location north 59:50.062, east 008:42.829, with elevation 1180 meter. Route description: From the very obvious trailhead across the road from the parking, pass through the gate and follow the trail (marked with red T-s as well as cairns). The trail first goes through a small saddle, then ascends across a fairly large slope. Higher up, a cross (old grave) is on the left side of the trail. At around 1550 meter of elevation the trail levels off and actually descends a bit before hooking up with the proper ridge of Gaustatoppen. From here on, the trail is well marked as it climbs the higher part of the mountain in several zig-zag moves. Eventually, a couple of huts will come into view, a bit higher one also sees a tower shaped structure. 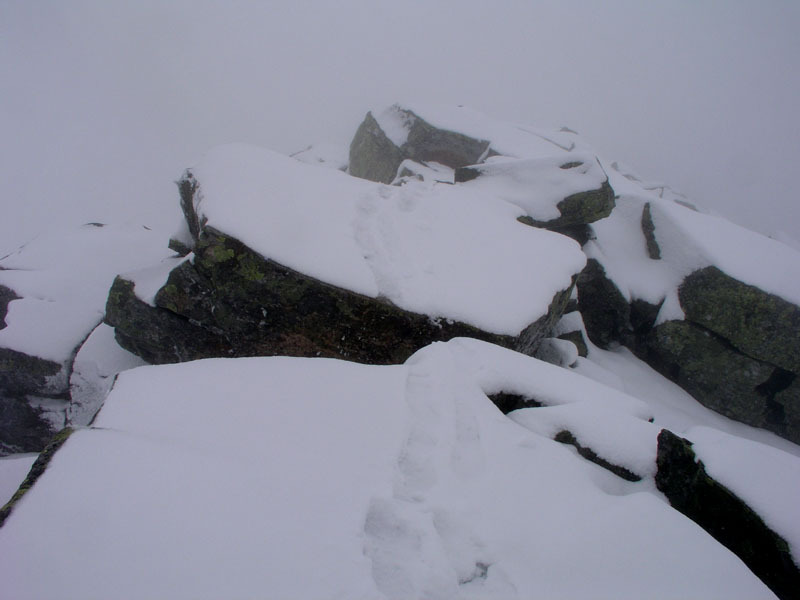 The summit is not here, another 500 meter of ridge needs to be traversed. Until here, the difficulty of this trail is (YDS) class 1, however, the ridge is class 2+. 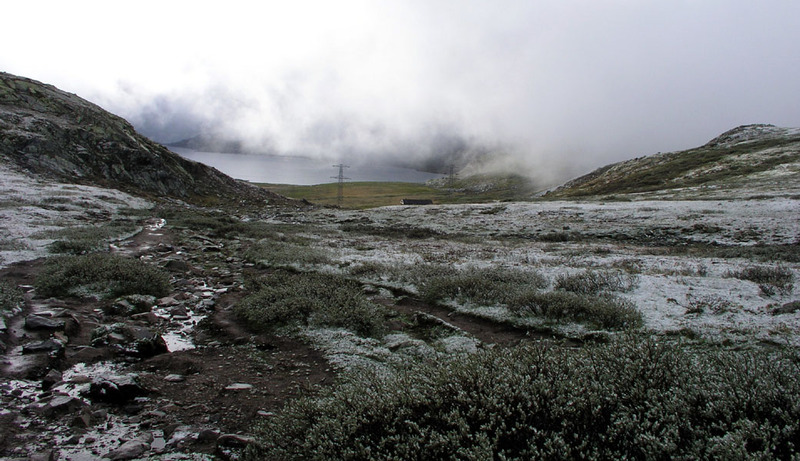 (When I was there, the difficulty was more like class 3 due to a thin layer of hard ice covered by new snow.) 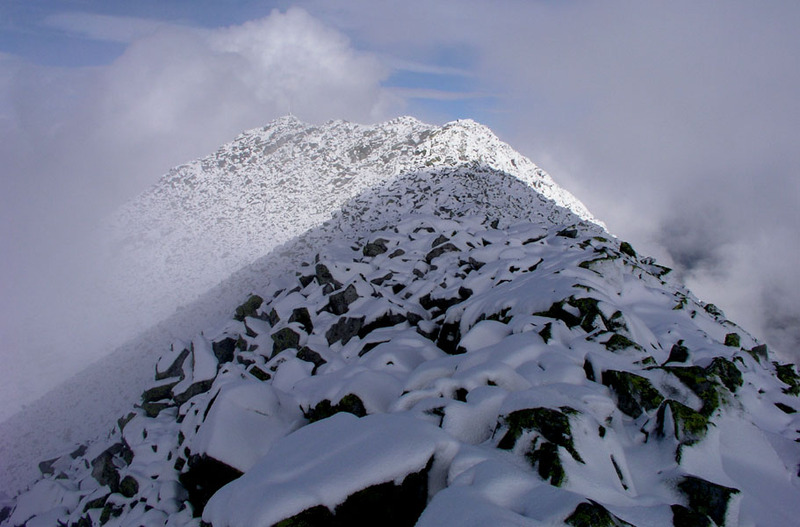 This ridge is quite distinct, but never very narrow. 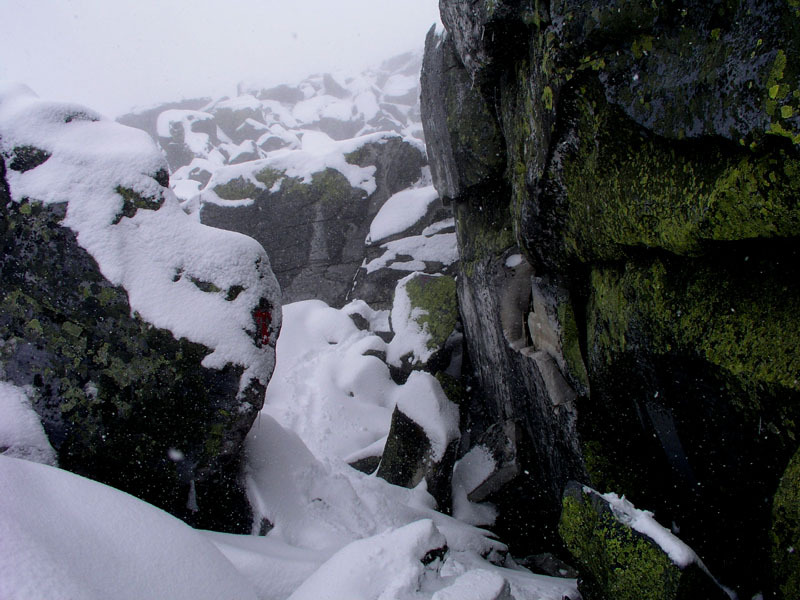 Huge boulders make for easy scrambling unless you have adverse conditions. This was indeed a better algorithm and fairly soon I noticed some old wooden poles and then a cairn followed by more signs of a trail. From here on the trail was very well marked with red T-paint, as well as cairns. I finally made the huts near the summit around 1045, almost 3 hours. 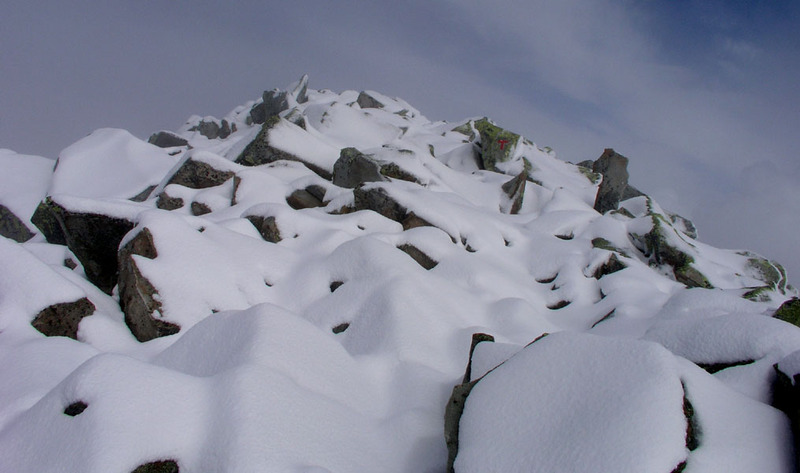 The ridge to the summit was covered by thin "blue ice" under 10-20 cm of new snow, a most unpleasant combination. It took me 25 minutes and great care to traverse to the summit. The clouds broke for about 30 seconds while on this top ridge, I then spent about 10 minutes at the top that is known for its excellent views, no such thing today. Another 25 minutes to get back to the huts, then one hour to the car. When I came to the place where I was temporarily lost, my footsteps seemed incredibly numerous. The explanation came as I overtook several parties (about 10 people) that all had followed my footsteps, gotten totally confused in the maze and then given up their hike altogether. I felt a bit sorry for them, however each party must navigate themselves, not just follow (possibly confused) footsteps. 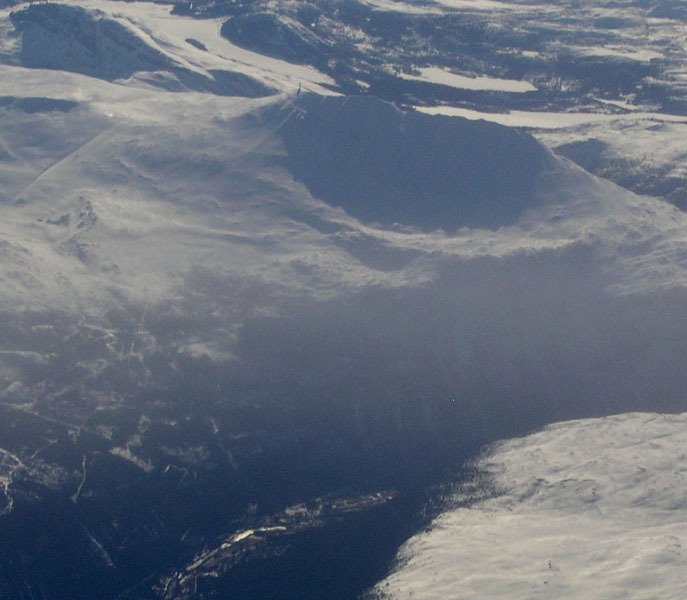 Gaustatoppen, as seen from the air on March 31, 2004. The tower and the long ridge can be seen. Gaustatoppen as seen from Gøysen (1370m), April 9, 2005. Looking back to the trailhead. There is already a trace of new snow. 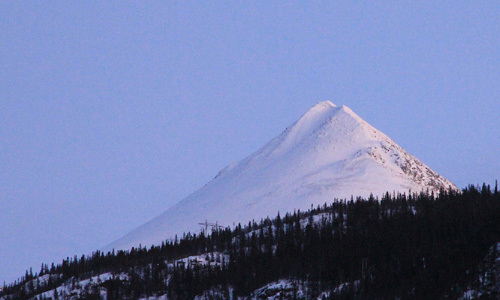 The Gaustatoppen ridge, icy rocks covered by new snow. The Gaustatoppen summit, at the end of the ridge. 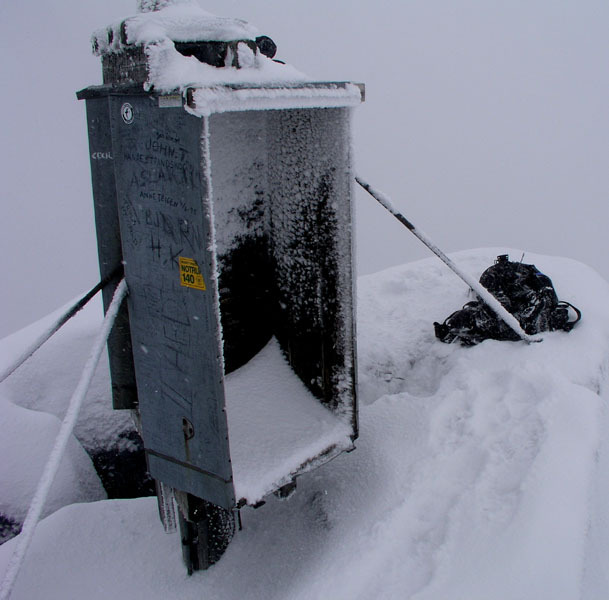 The summit is not particularly nice. The terrain is class 2+ between large boulders. The ridge is not very narrow, but was indeed slippery. The Gausta summit towers over Rjukan. Photo on January 19. 2013. 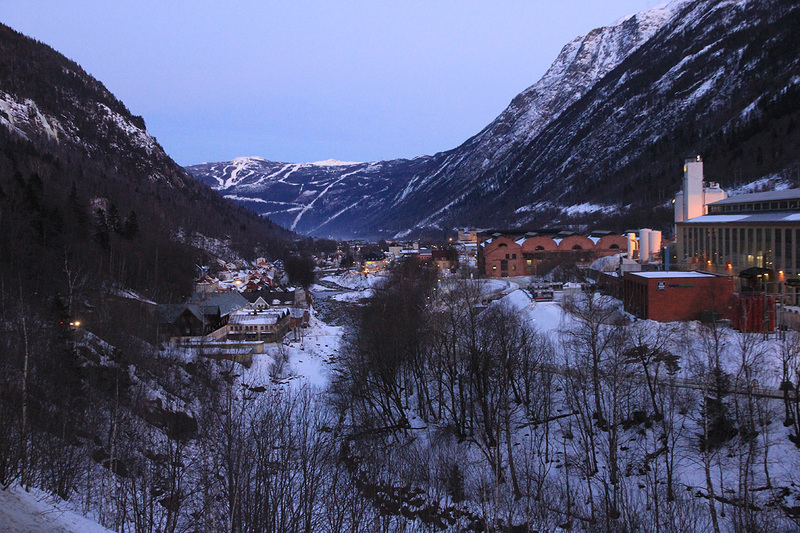 Rjukan as seen when descending from Mjøsvatn. Photo on January 19. 2013.